Sammy Lees Motors are delighted to welcome into stock this ONE owner 2015 65 Plate Nissan X-Trail 1.6L DCI Tekna with 130 BHP. Finished in a sumptuous Blue which is perfectly complimented by a luxurious full Black leather upholstery including heated front seats & 19" 5 double spoke diamond cut alloy wheels. 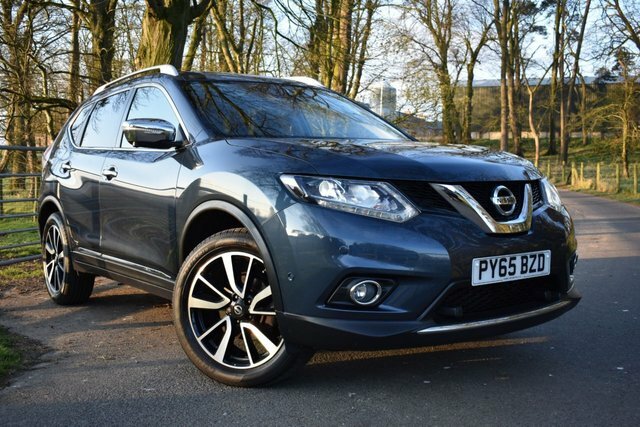 A crossover for families when a Qashqai's not big enough Nissan's latest X-Trail compact SUV adds style and comfort to the old model's substance. This vehicle further benefits from a full detailed service history having been serviced at: 6,613 miles on 21.11.16, 16,780 miles on 13.11.17, 23, 695 miles on 12.11.18 & will receive a full detailed service as well as 12 months MOT & 1 years full FREE in house warranty - offering complete peace of mind. This immaculate & high specification vehicle comes with * Sat Nav, * 360 Vision Camera, * Panoramic Electric Sunroof, * Cruise Control, * Bluetooth Connectivity, * DAB Radio, * LED Daytime Running Lights, * Automatic Headlights, * Dual Zone Climate Control, * Colour Touchscreen Audio Visual Display, * Key Less Push Button Start, * Electric Tailgate, * Refrigerated Dual Cup Holder, * ISOFIX, * 2 Remote Control Key Fobs, * Nissan Handbook Pack + Much More! If you're looking for a fun city car, a spacious family hatchback, a sporty crossover or a serious off-roader, Nissan is a manufacturer worth serious consideration. The Nissan Micra is a class-leading supermini, while the firm's Juke model set the standard for crossover vehicles. Browse the complete range of used Nissan cars for sale in Appleby In Westmorland here on our website and let a member of our team help you find a great deal on your next pre-owned vehicle. Here at Sammy Lees Motors Ltd we have a reputation for supplying quality used cars at affordable prices and we ensure that every vehicle is thoroughly tested before going on sale. Start the search for your used Nissan today.